St. Olaf’s Castle ( or Olavinlinna Castle) near Savonlinna, Finland, is one of the most beautiful historical and cultural buildings in Finland, also known as the land of a thousand lakes. In reality Finland has about 188,000 lakes, the largest being Saimaa Lake. Its English name Finland means “fen-land”, and the country was named for its many “high fens”. The country’s name in Finnish, Suomi, means the same. The territory we know now as Finland was first settled shortly after the end of the Weichselian period, around 8500 BC. From 1200 CE to 1809, Finland was a part of the Swedish empire. In 1809 Finland was conquered by Russia, and what was known as a personal union of the two countries was created. In 1917, Finland declared its independence. This was recognised in 1918 and the Republic of Finland was born. 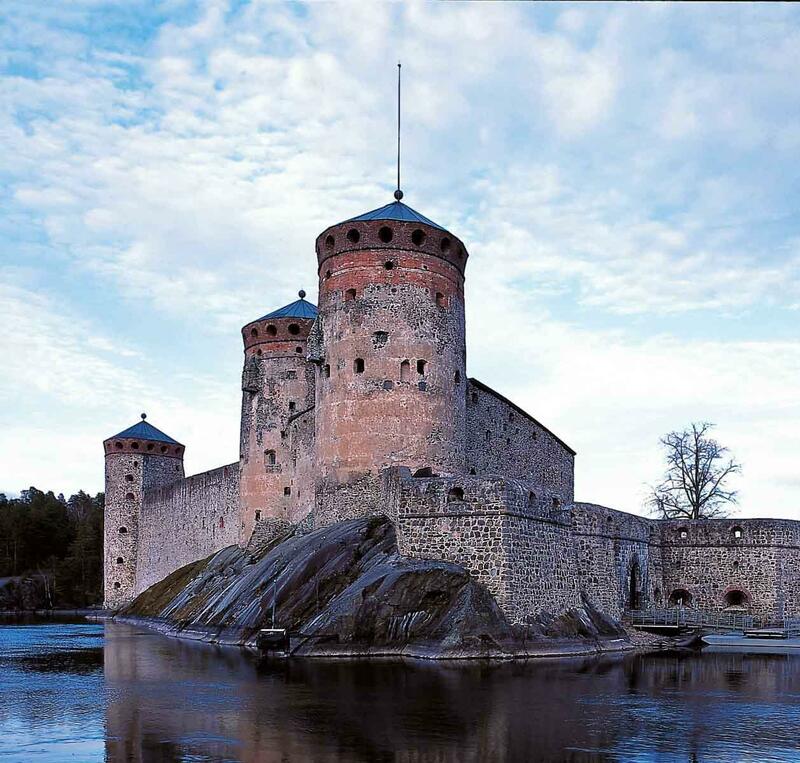 St. Olaf’s castle is famous for its rich and dramatic history and ambience, as well as for its annual opera and ballet festival, Savonlinna Opera Festival. The 15th-century fortress is situated in splendid surroundings. 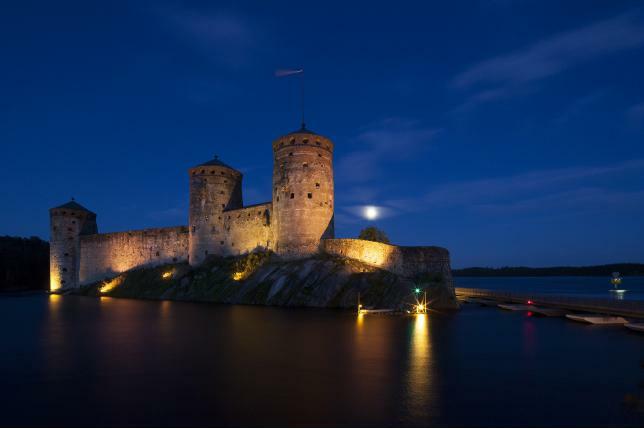 Construction began around 1475 near Savonlinna in the south of Finland, about 400 kilometres north of Helsinki. Since it is protected on all sides by water, it is also called “the water fortress”. The Danish-born founder of the castle, Knight Erik Axelsson Tott, decided that a powerful fortification should be built to protect the strategically important Savio region. The castle was intended to repel Russian attacks from the east and to guarantee the Swedish Crown control of the Savo region. The history of Olavinlinna is a mixture of medieval weapons clashing, cannons roaring and everyday chores inside the security of the castle’s thick walls. The changes in ownership of Olavlinna Castle can be seen in its varied architecture. 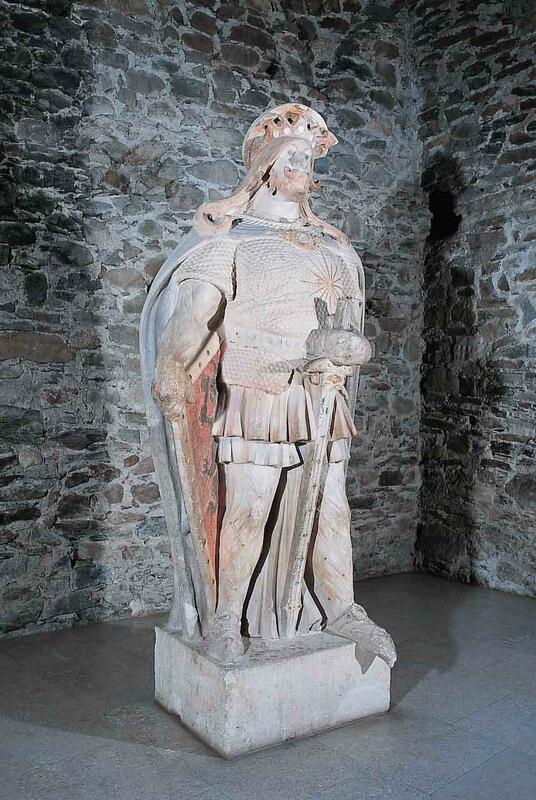 There are two small exhibitions in the castle: the Castle Museum,displaying artifacts found in the castle or related to it, and the Orthodox Museum, with icons and other religious artifacts from both Finland and Russia. Olavinlinna, a castle with three circular towers instead of square towers, is the northernmost medieval stone fortress still standing. The castle is built on an island in the Kyrönsalmi strait, connecting lakes Haukivesi and Pihlajavesi. 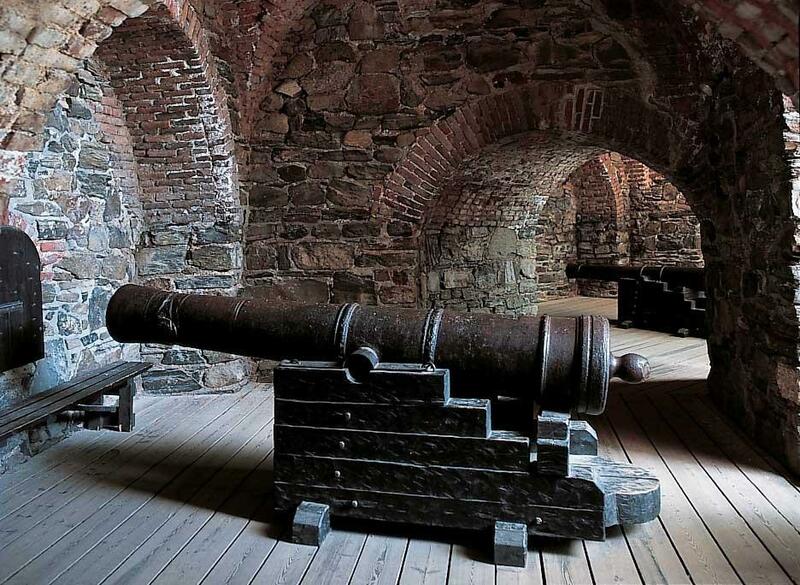 It was the first Swedish castle with a set of thickset circular towers able to withstand cannon fire. It is not by accident that the castle was built in a network of lakes and waterways, for they would seriously impede a potential Russian offensive. Olofsborg (the castle’s Swedish name) withstood several sieges by the Russians during the First and Second Russian-Swedish wars. 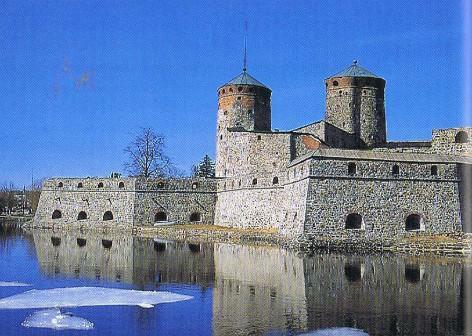 A brisk trade developed under the umbrella of the castle towards the end of the 16th century giving birth to the town of Savonlinna, which was chartered in 1639. 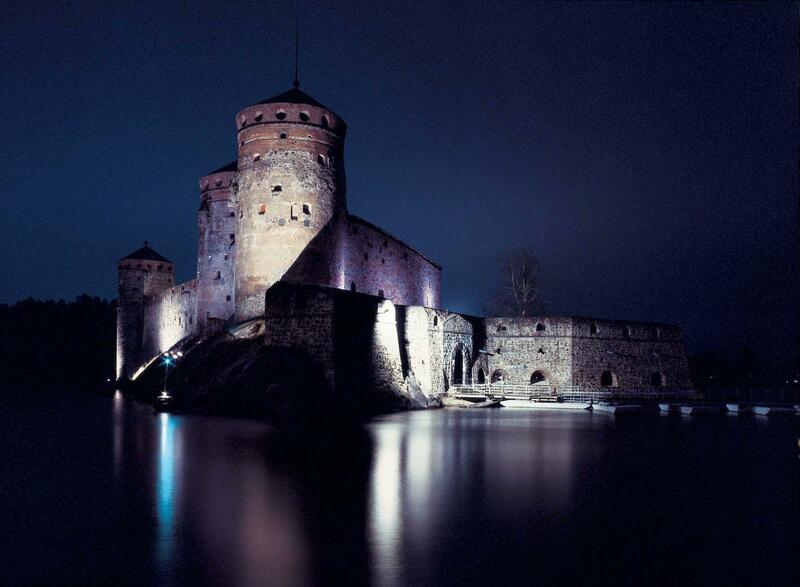 The castle forms a spectacular stage for the Savonlinna Opera Festival, held every summer since 1912. St. Olaf’s Castle was built as a fortress to protect the eastern border from Russian invasions. Regional defence was the responsibility of the Crown castles, which also served as administrative centres. St. Olaf’s Castle, built next to the border of the Swedish-Danish Kalmar Union, was named after the patron saint of knights, St. Olaf. The castle withstood several sieges by the Russians before capitulating in 1714. Today the castle’s halls and rooms can be rented for all kinds of events even in winter, since there is electricity and heating in the halls where people want to stay or hold events. General manager (keeper) of the castle Jouni Marja-mäki, has been managing the historic castle for over two years. “I am in charge of how the castle functions, public services, and organizing events and exhibitions. “I am also the keeper of another castle in Finland, which is Häme Castle, also a medieval castle, located on the coast of Lake Vanajavesi. I studied art history in Helsinki and I have a passion for old buildings, castles and cultural history. I have always been greatly interested in architecture. I started to work at the National Museum as a curator, and eventually I was given a higher position and became the keeper of two castles.” Olavinlinna Castle was built as a fortress, not for the royal functions. The only Swedish king ever to visit the castle was King Gustavus Adolphus II of Sweden in 1622. Jouni Marja-mäki explains:”It is not a fancy castle, but a means of defence at the border between - at that time - Sweden and Russia. Olavlinna Castle does have a King’s Hall, because in Sweden at the time a castle had to also have a room where the king could receive his guests and to hold meetings. The charm of the castle is its location in a very beautiful scenery, on a rocky island. The south side of Olavinlinna Castle is protected by three bastions. It fills the island, and is near two lakes, with a very strong current between them. The lake never freezes over, because of the strong currents. It is a most singular environment, with beautiful nature around you. Also, when you walk in, you feel the authentic atmosphere. In a way it is very masculine and rough. One has to enter the castle with a guide, because it is very narrow, with spiral and steep staircases, and you can easily get lost inside.” The castle has remained a water fortress, with the only access by boat or by bridge. The castle was connected to the mainland by wooden pontoon bridges. These floating bridges were maintained until 1857, when they were destroyed by a storm. New pontoon bridges were put into use in 1974. The ground floor of the Watergate Bastion contains eight vaulted casemates with gun ports. A casemate is a covered shelter for guns and soldiers. Erik Axelsson Tott, the founder of St. Olaf’s Castle, became administrator of all the Swedish Eastern Lands and keeper of three castles: the Turku, Häme and Viipuri Castle. He was now one of the most powerful men in the union state, and under his influence the Axelsson family dynasty became a major political force. Erik’s connections with Tallinn in Estonia influenced his plan for reinforcing the eastern border defences. La Traviata, Giuseppe Verdi, Savonlinna, 2013. The Savonlinna Opera Festival in Finland, held annually since 1912 in St. Olaf’s Castle, celebrated its 100th anniversary in 2012 with a look back at its rich opera tradition, which achieved world-wide fame and which was attended by many world-famous opera singers and opera companies. The birth of the Savonlinna Opera Festival is closely connected to the rise of Finnish national identity in the early 20th century. In 1907, the year in which Finland saw its first democratically elected parliament, a political assembly was held in St. Olaf’s Castle. 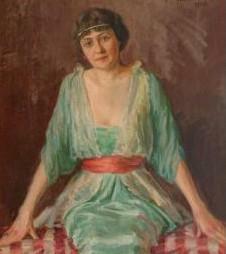 The famous Finnish soprano Aino Ackté (1876-1944) was also present. Aino Ackté, the Finnish soprano legend, founder of the Savonlinna Opera Festival at St. Olaf’s Castle.